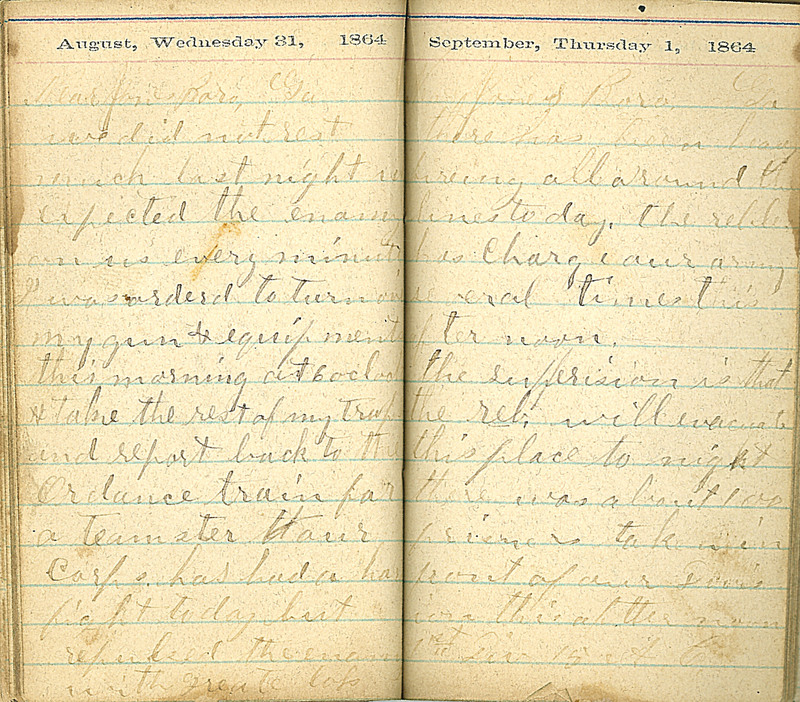 August, Wednesday 31, 1864 Near JonesBoro, Ga. we did not rest much last night we expected the enamy on us every minute. I was ordered to turn in my gun & equipments this morning at 6 oclock & take the rest of my troops and report back to the Ordance train for a teamster our corps has had a hard fight today but repulsed the enamy with great loss September, Thursday 1, 1864 Near Jones Boro, Ga. there has been heavy fireing all around the lines today. the rebles has Charge our army several times this afternoon. the superision is that the reb. will evacuate this place to night there was about 100 prisners taken in front of our Division this aftternoon 1st Div 15 A.C.